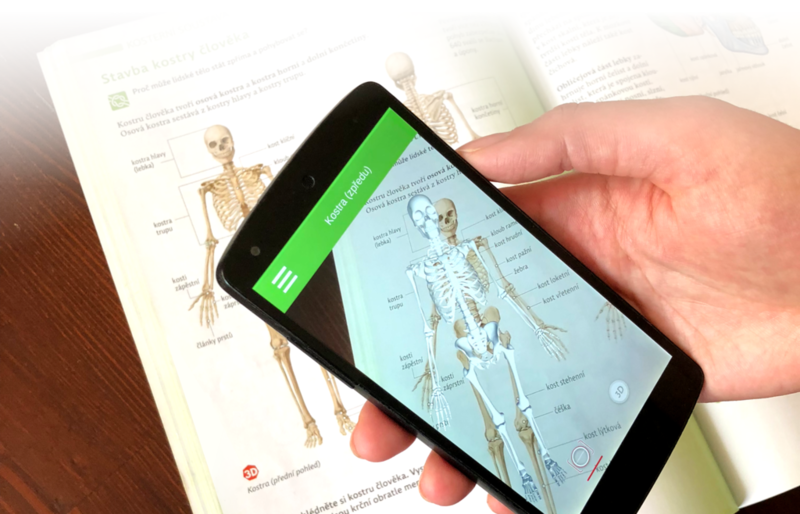 The goal was to build an ecosystem which allows students in elementary and high schools to benefit from the Augmented Reality experience during the time spent with textbook while they are learning and exploring - in the classroom or at home. The aspect of the accessibility of the solution was very important here, because the target customer market are elementary and high schools in the Czech Republic. Unfortunately, in such environment are financial resources of both students and schools very limited. Which defines an important requirement. The solution had to be built with such level of effectiveness and compatibility which would allow our client - the Fraus Media publishing to sell the new augmented reality textbooks for the exactly same price as before, in order to make them affordable to the students and schools. We developed the companion Android mobile app which needs to run on mobile devices students have in their pockets. Because elementary and high schools in Czech Republic can’t afford to support their students with any hardware. The solution consists of development of system which allows our client to enrich textbooks with augmented reality through the mobile application for Android. We developed AR (Augmented Reality) mobile application for Android devices in Unity Engine. This mobile application is a companion app for textbooks. While reading the book, students can use the Android app with the augmented reality content and interact with it. Highly optimised and carefully curated and reviewed set of 3D models for each textbook. The 3D models used are precise (for education purposes) and highly optimised (we need to show them both in the web browser and on low-end Android devices). A pipeline which allows compilation and deployment of the 3D models into the mobile application and online to FRED platform of our client. This design was about simplicity. User interface of an application which is presenting a visual content had to be clean and simple. And sure very clear at the same time, the application will be used by very young students. The tricky part in this project was the required level of optimization we had to meet in order to make the Android mobile app and 3D models compatible even with the low-end Android devices - both tablets and phones. Every single 3D model had to undergo a multiple rounds of careful review process where each and every aspect of its factual precision had to be tested. In average, there were 4 iterations of reviews and adjustments per 3D model. The augmented reality content is mapped on the image from a textbook. The application is developed in Unity. 3D models are stored locally. Due to the lack of memory on target devices, the application downloads all the needed data from the cloud and only data of the active textbook are then kept. Together with our client, we have managed to bring the Android app to Czech students into their schools within a wonderful period of 2 years full of great feedback from students, their teachers and parents. We are proud of that we had a chance to develop mobile application with such important impact on everyday experience of young minds.